I use this disc for shots that need a good finish either way. Nice skip shots. They fly really well in strong winds. I carry 3 in my bag, beat in to new. I prefer the 168g models for my arm speed. I am able to trust them to always come back left for me and not turn over when I do not want them to. When driving into a headwind, I reach for my new one with confidence. The Z Force is monster when eating up the wind! 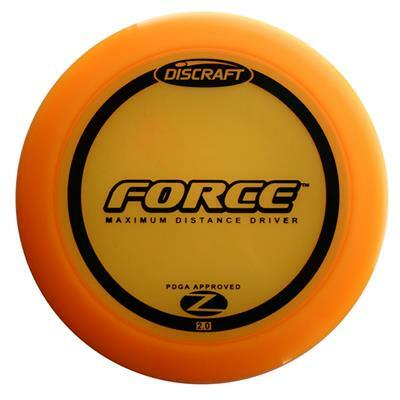 I use this disc mostly for forehands that I need to shape shots up to 320 and backhands with a headwind. Super dependable fade and also has a good rim for any hand size. If you're looking for a disc to combat the wind you need this disc in your bag! The Z Force is an absolute bomber. Stable flight that has incredible glide. Amazing disc for backhand and forehands. This disc has really changed my game! The Z line force... I cant get enough of these. I need back uos for my back ups. This thing goes far and fast. It is an overstable high speed driver that really behaves well in the wind. I love the feel of the Z line plastic and the way it breaks in over time. These things have found the chains for me again and again. Yew!! !